These pictures are a little dark - as set up was complete at 8 pm, and the lights were dim in the venue. Fantasy of Flight has a HUGE hanger with lots of room to serve as a large dance floor for your Homecoming, Prom or Corporate Function! Giant Hibiscus Foil with 4 latex arranged on weight. 20 inch Hibiscus print Bubble Balloon with 4 latex. 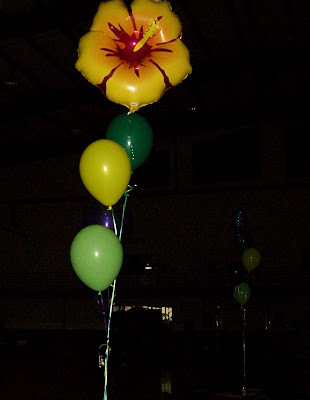 Don't worry with renting and trying to Lug around a helium tank, call us for a quote to take care of all the Balloon Details and decor for your next celebration!